Proceeds from the sale of these cards, books, and shirts go towards funding our science and environmental education programs. At this time we do not have an online store. 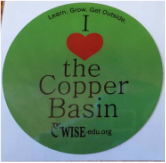 To arrange an order, simply call our office at 907-822-3575 or send us a message at contact@wise-edu.org. Bulk pricing is available for large orders. Thank you. These stickers are durable enough for both indoor and outdoor use. Designed by our AmeriCorps VISTA Jamie. WISE is pleased to introduce a series of notecards by Alaskan watercolorist, Beryl Wardlaw. Fifteen unique scenes evoke the history, scenery, and daily life of the Copper River Valley. ​Each card is a high quality digital reproduction printed on heavy matte stock, and packaged with an envelope in clear presentation sleeves. Carefully researched descriptions on the card backs share the story behind each picture. These fun WISE shirts were tie dyed by our staff! They feature a small WISE logo on the left front breast pocket and our slogan "Learn, Grow, Get Outside" on the back. Available in various colors in Men's S, M, L:, and XL sizes. ​These are one of a kind - call for availability! ​From pasque flowers in May to the tundra roses of August, visitors and locals alike will enjoy this handy plant guide from WISE’s own naturalist, Cara Wardlaw-Bailey. 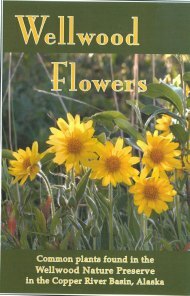 Organized by blooming season, this book is an invaluable resource on the common plants of the Copper River Basin.